Having launched last month, 3CX’s new V16 offers a host of new features and benefits, some of which we think add great value. 3CX Live Chat & Talk comes as a WordPress plugin for easy installation or can be added to any website via script and enables website visitors to either ‘click to chat’ or ‘click to talk to an agent’ directly from their computer. With seamless Office 365 integration, contacts and their status are synced in real time, enabling easy team communications from a 3CX extension. Multi instance manager, enabling you to manage all of your 3CX deployments from the reseller portal. Enhanced security features including console restriction. Remove the need for downloads and access 3CX from your web browser. There are lots of different 3CX licences available and you’ll need to make sure you order the right system for your customer depending on whether they would like a subscription or perpetual licence, the number of users they have and what features they require. The list of licence part codes looks long but really they are quite simple. We’ve put this quick reference guide together to help you to quickly pick out the correct part code for your install. With less than a week to go until the launch of 3CX’s V16, 3CX are inviting partners to join their Live Launch Session at 15:00 on Wednesday 27th March, simply head over to their YouTube Channel on Wednesday to find out more about the much anticipated version update. As part of their revamp, 3CX implemented a new pricing structure last week. The new pricing saw reductions of up to 40%, making many licences become more competitively priced. Please note, however, the pricing of some perpetual licences has now increased. Licences for anything below 16 sc are now only available as annual licences. Customers who currently have 4 and 8 sc licences on a perpetual basis can continue to renew their maintenance or upgrade to 16 sc. In order to maintain the same license features on V16 commercial standard keys will be upgraded to professional. If you do not wish to upgrade to V16 or to be upgraded to a professional licence, please disable automatic updates on the PBX now. If you would like to speak to a member of our team about 3CX and how these changes may affect you, please call 01484 840048 or email contact@provu.co.uk. As you may be aware, 3CX are changing their free and standard licences as of 1st April 2019. In order to help you prepare for these changes, we will be putting together a series of blogs which will break down the changes for you. These features will remain available on Pro and Enterprise level licences. If you are already on a paid version of the Standard licence and still have valid maintenance you do not need to do anything, your licences will be upgraded to Pro free of charge for the remainder of the licence contract. Following the licence duration, you will need to renew your licence via Pro maintenance to maintain these features. All free licences downloaded from 3CX’s website after 1st April 2019 will be a V16 Pro annual licence. This licence will be valid for 40 days from the initial activation date. Following this, the licence key will then revert to a standard licence unless it is upgraded. ProVu can also now help you source a proof of concept key for any licence for 30 days. Simply contact our sales team to discuss your projects and organise a free trial key. To discuss any of the above information with a member of our team please call 01484 840048 or email contact@provu.co.uk. We’ve added an additional date to our 3CX basic training course in April. Following a successful kick start to 2019 with our January basic training course, our 4th April course is now full, but worry not, we have added an extra date on the 3rd April 2019. Register now to reserve your free space! Both of our April courses will be supported by Snom who will be present at the course to answer any questions you may have about getting up and running with Snom and 3CX. Attendees will also receive a free Snom D712* handset, enabling you to test out 3CX’s functionalities for yourself. *Please note, free phones are limited to one per company. Places will be allocated free of charge on a first come, first served basis. Please note, these courses have a limited capacity – if you would like to arrange a course for 6 or more people please contact us. 3CX recently made some changes to their partner program and ordering procedure to offer partners more options. These changes have now been implemented, meaning you can start to enjoy the benefits right away! You can now renew your perpetual and annual 3CX licences through ProVu making it even easier for you to streamline your order processing and gain access to our excellent pre and post-sales support. As with all 3CX licences, renewals can be purchased with a ProVu credit account, giving you more flexibility. Traditionally based on quarterly reviews of your annual revenue, partner levels are now assessed every 6 months making it easier for you to forecast your margin and retain your partner status for a longer period of time. If you would like to discuss any of the above information with a member of our team or would like to learn more about spreading the cost of your renewals with a ProVu credit account, please call 01484 840048 or email contact@provu.co.uk. With the New Year quickly approaching, now is the time to start to think about the new year that lies ahead. With that in mind, we have scheduled two 3CX Basic Training Courses for 2019. Whether you’re an experienced 3CX partner looking to refresh your knowledge or are looking to add 3CX to your portfolio, our courses are open to all resellers. Taking place at our offices in Huddersfield, West Yorkshire, our 3CX accredited trainer and Technical Support Manager, Andy Devine will be covering everything you need to know to sit the basic certification exam. Simply select your preferred date and register today to reserve your free space! 3CX has become a popular choice among many of our resellers, but what is it that makes ProVu the optimum partner for these award-winning IP PBX software licences? With a wide variety of compatible devices, we can supply you with all of your hardware requirements. Whether you’re looking for a 3CX accredited desk phone or headset, we can help you to offer the complete 3CX solution and ship direct to your end user customer with your own branding the very next day. We are accredited 3CX trainers and host regular training courses at our offices in Huddersfield. These free courses are accessible to all, regardless of your 3CX level and help you to gain better discounts on your licences. Our expert team of 3CX certified engineers are on hand to offer you pre and post sales support, helping to ensure you are able to access the correct information and advice when you need it. We can even offer a remote configuration service to help ensure your installation goes as smoothly as possible. We know you want your licences when you order them, not days later. Thanks to our integration with 3CX’s system and our online portal, ProSys, we make ordering licences a simple, fast process. And it doesn’t stop there, we’re constantly on the lookout to improve our product offering and are currently exploring new products such as call recording software to enhance your 3CX offering… watch this space for more information coming soon! We will be running two 3CX Intermediate Training Courses next month. Suitable for those looking to advance to the next level with 3CX, our intermediate training is open to all 3CX partners. Designed to equip you with the knowledge to take the intermediate certification exam, our Technical Support Manager and accredited 3CX trainer, Andy Devine will cover everything you need to sit the intermediate certification exam. Simply select your preferred session and register today to reserve your free space and receive a free Snom D712 phone! Please note, these courses have limited capacity. Places will be allocated free of charge on a first come, first served basis. We will be running two 3CX Basic Training Courses later this month. 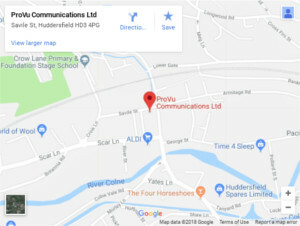 Available to all ProVu resellers, the courses will take place at our offices in Huddersfield, West Yorkshire and are aimed at equipping you with the knowledge to sit and pass the Basic Certification exam. Simply select your preferred session and register today to reserve your free space! Places will be allocated free of charge on a first come, first served basis. Please note, these courses have a limited capacity – if you would like to arrange a course for 4 or more people please contact us.